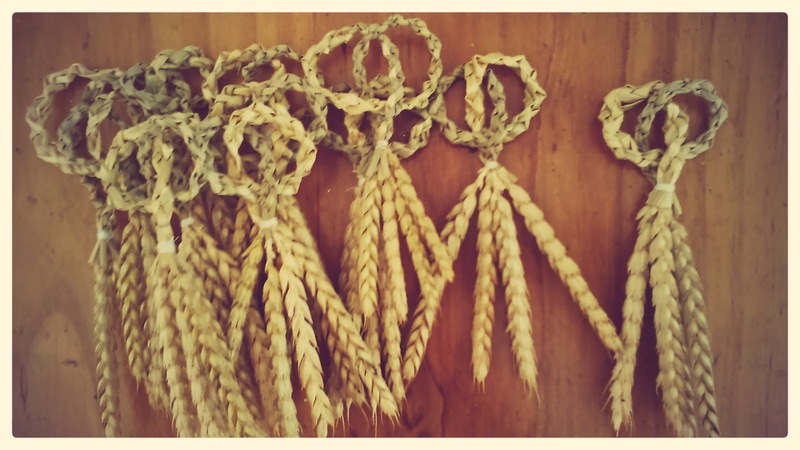 My attempts at creating a couple of Harvest Knots. According to ancient folklore, there was a tale of an old hag who turned into a hare to steal the cow’s milk. This story also mentions putting out the hag who was driven from field to field until she reached the last field of the last man in the village to cut the last sheaf. The hag could go no further and it was the unfortunate lot of the tardy farmer that he must support the hag or hare for a year. Interestingly, in many parts of Ireland, the last sheaf itself was called the cailleach or hag. 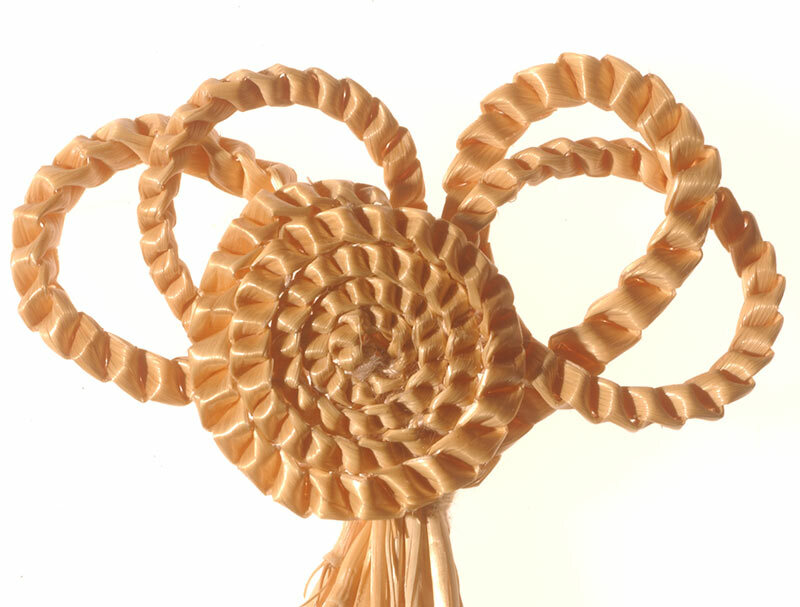 In Co. Carlow, the girls were invited to cut the last sheaf and, according to old superstitions, the one who succeeded with one blow would be married within the year. In the midlands, the owner of the field, or in some cases, the youngest present, was chosen to do the final cutting. In other areas, lots were drawn. Ominously, it was said in some parts of Ireland that the person who cut or bound the last sheaf would die unmarried. As might be expected, that last sheaf received extra-special attention. Usually, it was tied differently from the rest and it was carried from the field by the one who had cut it. It signified a major closing chapter in the Irish agricultural year and our ancestors sprinkled water on the bearer and the sheaf. In Co. Leitrim, this was done to prevent drought during the next year. In Co. Clare, it was specifically holy water that was sprinkled on both the cutter and the sheaf. The usual destination of the cutter and the sheaf, accompanied by all of the field hands, was the door of the farmer’s house. On arrival, they’d announce that the hare was sent on and a treat for cutting the final sheaf was asked for. In some cases, the farmer or his wife “bought” the sheaf so that the workers could celebrate at the local pub. Alternatively, the farmer’s wife promised the reward of “a mighty dinner” at a traditional Harvest Home. On a small farm, the Harvest Home feast would have been held in the kitchen. On larger holdings, the festivities took place in the barn – cleaned out and dressed up. Prominently displayed as part of the decor was the last sheaf. And, if it was held in a part of Ireland where a young colleen had tied the last sheaf, it was the custom that she would be led out for the first dance by the farmer or his eldest son. It was at these gatherings that harvest knots were worn to show that the harvest was completed. Usually, they were made in two types: an elaborate braid with the corn ears still attached which was worn by the women, and a less ornamental twist – although made with equal skill, which was made for the men. 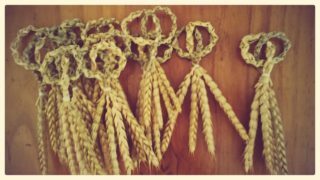 The custom of making harvest knots is is found in east Co. Cork, eastern Offaly and Laois, north Co. Dublin, and in a wide area of Ulster, with concentrations in Co. Armagh and east Co. Donegal. Those particular regions would instantly tell the informed reader that this custom isn’t originally Irish. It was widespread in England and Scotland and was brought to Ireland during the plantations. While the knots were an imported tradition, parts of Ireland could lay claim to customs that were most definitely her own. In Co. Kerry, for example, the end of the harvest was called The “Clousúr. On the Dingle Peninsula, the menfolk brought their harvesting implements, spades, and reaping hooks into the kitchen and threatened to burn them unless the women prepared a festive meal. The men would go through the motions of destroying the implements by throwing them into the fire; the women would then make a great show of rushing to save them and promising to prepare the meal that evening or on another occasion. This same custom appears to have been prevalent throughout parts of Connaught, as well. In the old days, a good worker always re-sharpened his scythe or reaping hook when his work was done. At the end of the harvest, every effort was made to put an even keener edge on the blades before they were stored away. There was even a charm called the ortha an fhaoir – “edge-charm” – which was often recited to help support the worker’s sharpening skills. Not everyone could produce a perfect cutting edge and it was said that those who could had ‘the gift’. Workers so endowed were duly proud of their ability. Once sharpened, blades were protected with pieces of wood or were wrapped with ropes of straw. Implements were then stored away in readiness for the next season. 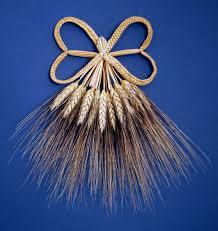 As for the last sheaf, in general, it was hung up in the house or barn until it was replaced by a new one at the following harvest. But, in some areas, different customs were observed. In Co. Donegal, crosses were made from it on St. Brighids Eve. In Co. Galway, it was sometimes made into ‘bobbins’ for the roof-ridge of the house. In yet other areas, it was said to have curative powers and was often given to sick animals or calving cows; also, the grain from the sheaf was burned to ashes and then made into an ointment as a remedy for skin ailments. In Co. Offaly, the grain might be added to one of the Harvest Home dishes; in Co. Laois, it was often thrown to the fowl and the first rooster to reach it was marked down for slaughter on St. Martin’s Eve. Other farm folk fed it to their horses to increase their strength, or to the chickens to ensure a plentiful supply of eggs. One custom that was well known throughout Ireland was the use of a sheaf to find a drowned body. A lighted candle was set on the side of the sheaf which was then placed in the water where the person was thought to have fallen in; it was allowed to drift until it came to rest where the body could be found. Many people believed that only a last sheaf would be successful in this sad pursuit. In conclusion, while Catholic Ireland celebrated the Harvest Home, Protestant Ireland held Harvest Thanksgiving services and used the last of the harvest to decorate the churches. 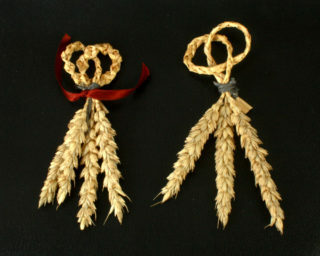 In many parishes, those with deft fingers and an eye for proportion were called upon to make ‘dressed calliaghs’ – miniature corn ricks -which were given pride of place among the decorations. In parts of east Ulster, where the flax crop was on major importance, the end of the “lint pulling” was marked with a celebratory harvest supper, and in the southwest, at the end of the potato harvest, the workers were given a Stampy Party; it was called that because the main dish was cakes of stampy – a bread made from grated raw potatoes, squeezed dry and mixed with flour, and a variety of flavorings. Following the meal, they held a dance. Whatever crop was being harvested, the end of the work was always cause for celebration. With the crops in and safely stored away in the byre or the barn, the people of rural Ireland could now rest assured that they would have sufficient food to feed themselves and their livestock during the harsh winter months that lay ahead. This page was added on 29/04/2017. Great article Gerry… we might link to it if that is OK? No problem at all. Do whatever you need. Hope all is well on your end.